Published on May 22, 2011 in Gluten-Free, Ingredient Foods and Low-Sodium. Closed Tags: sauce, tahini. This is great on just about any type of vegetable, but it is absolutely awesome with baked cauliflower. Makes 4 servings. In a cold saucepan, add all ingredients, except the parsley, and whisk together. Over low heat, gently warm the sauce to just above room temperature, and be careful not to simmer or boil. Tahini stays creamier and maintains a much better consistency at lower temperatures. Add additional water as needed if it seems a little too thick. Top with parsley and serve with Baked Veggies or Grilled Vegetables and Tofu. 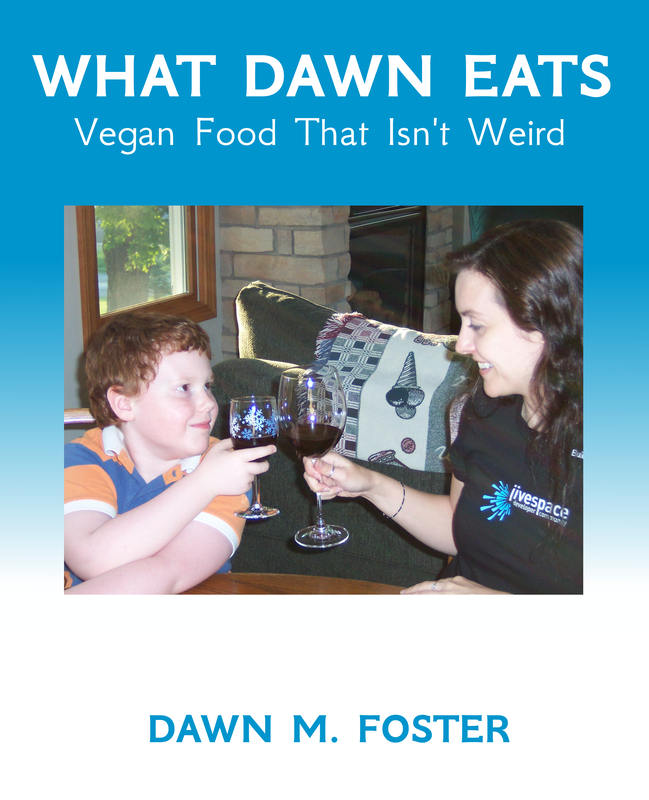 Published on May 20, 2011 in Gluten-Free, Ingredient Foods and Low-Sodium. Closed Tags: italian, marinade, tempeh. This is my favorite marinade for tempeh, but it’s also great with tofu or brushed onto vegetables before you throw them on the grill. Combine all ingredients and stir or whisk to combine. Experiment with some different spices. This marinade can be a little strong for some people. If so, you can add 1/4 cup of water or vegetable broth to tone it down a bit. Omit the tamari for a low-sodium version. Add a little extra balsamic vinegar or water if you need more liquid. This is great as a side dish, but my favorite way to use it is as part of the Tempeh Salad. Makes 4 servings. Cut tempeh into 1 to 1/2 inch wide cubes. Combine marinade and tempeh in a sealed bowl. Cover and shake well until all pieces are coated. Place in the refrigerator for one hour or overnight shaking the container every now and again (when you think of it) to coat all pieces. The tempeh will begin to absorb all the marinade. When ready to cook, heat a non-stick skillet over medium low heat. Add tempeh and any liquid and cook for 5 to 10 minutes, stirring to turn the pieces until all of the liquid has evaporated or been absorbed. Serve immediately or keep in a covered container in fridge. Slice the tempeh into larger strips and grill them instead of cooking them on the stove. Omit the tamari in the marinade for a low-sodium version. Add a little extra balsamic vinegar or water if you need more liquid. 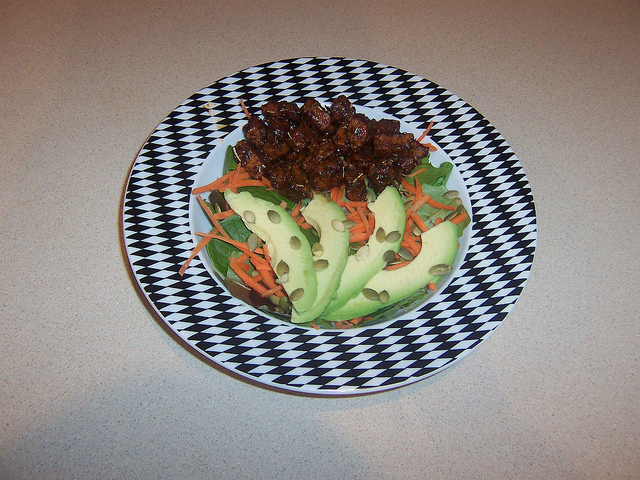 Pictured: Italian Marinated Tempeh used on a Tempeh Salad. 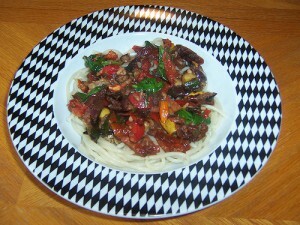 Published on May 18, 2011 in Dinner at Home, Gluten-Free and Low-Sodium. Closed Tags: acorn squash, barley, squash. Served in half a squash, this makes a really nice main dish or side for any fall holiday dinner. While it has quite a few ingredients, most of them are fairly common so this dish comes together more quickly than you might expect. Makes 2 servings. Cut squash in half, remove seeds, and bake cut side down for 30 minutes. While the squash is cooking, sauté the onions in oil for about 5 minutes or until they start to turn translucent. Add celery and carrot and sauté until they are tender, but still firm. Add mushrooms, and continue cooking until they are soft and start to release their juice. Add garlic and stir to combine. Add port or wine and simmer for about a minute. Add barley, raisins, pine nuts, sun dried tomatoes and walnuts. Stir to combine. Add sage, red pepper flakes, salt and pepper. If it gets too dry, add some water from the sun dried tomatoes and add a drizzle of olive oil. Continue to cook over low until everything is combined and hot. You can remove from the heat and cover to keep warm if it starts getting too done or drying out before the squash is ready. After the squash has finished cooking cut side down for 30 minutes, flip them over to fill with stuffing. Add stuffing to interior of squash, mounding as needed, and bake covered another 20 to 30 minutes. For a crunchier top, remove cover for the last 10 minutes. Try this with quinoa, brown rice or other grains in place of or in combination with the barley for something a little different. Experiment with different dried fruit to replace the raisins – dried cherries or cranberries are good. 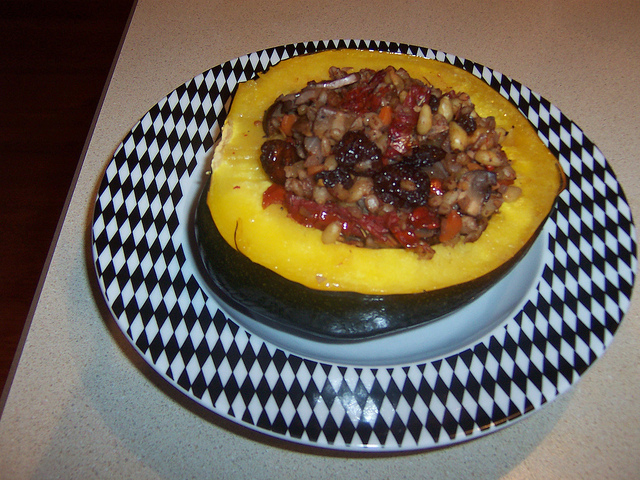 If you are using a small acorn squash, you can probably cut the recipe in half. You could also reduce the stuffing recipe and not heap them as full. Replace the barley with quinoa or rice for a gluten-free version. * Note: This recipe is for a large acorn squash. If you are using a smaller squash, you’ll want to reduce the amount of filling made. If you end up with extra filling, it makes a great side dish or snack for later in the week or to eat while you are waiting for the squash to come out of the oven. Published on May 16, 2011 in Dinner at Home, Gluten-Free and Low-Sodium. Closed Tags: cauliflower, indian. 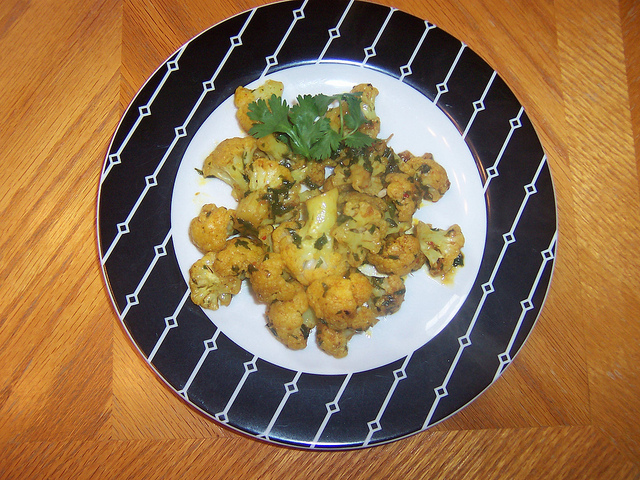 This is a lighter, less saucy, baked version of something similar to Aloo Gobi, but without the potatoes. I think it’s a nice compliment to the Chana Masala and Creamy Red Lentil Dal when served together in a big Indian meal with rice or naan. Makes 4 servings. Cut the cauliflower into medium sized florets and place in a large mixing bowl. In a small bowl or measuring cup, whisk together olive oil and all of the spices except for the cilantro. Drizzle the oil and spice mixture over the cauliflower. Add the cilantro and stir to combine. Add a little more oil if it seems too dry for your taste. Transfer spiced cauliflower mixture to a glass baking dish. Cook covered for about 30 minutes or until the cauliflower is tender. Stir once or twice during baking. For the saucy version, add some chopped or pureed tomatoes. Substitute potatoes for some of the cauliflower. You might need to cut the potatoes into smaller chunks or plan to cook it a little longer with the potatoes. Can be easily made low-sodium and gluten-free. Published on May 15, 2011 in Dinner at Home, Gluten-Free and Low-Sodium. Closed Tags: chickpeas, indian. A relatively simple Indian dish for when you don’t have a lot of time to spend making dinner. Makes 4 to 6 servings. Sauté onions for 3 to 5 minutes or until translucent over medium heat. Add garlic and spices. Stir and cook 30 seconds stirring constantly. Add tomato puree, vegetable broth, chickpeas, lemon juice, and margarine. Mix well. Cover and cook for at least 15 minutes stirring occasionally. You can also cook it a little longer to get better blending of flavors. 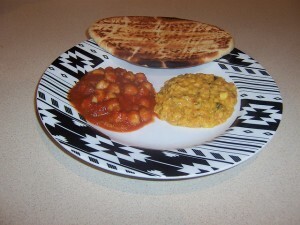 Pictured: Chana Masala (left) and Creamy Red Lentil Dal (right) with naan. Use fresh tomatoes, instead of tomato puree (you’ll need to increase the cooking time to thicken). Serve with naan, instead of (or in addition to) the rice. Experiment with adding a few additional vegetables. Published on May 12, 2011 in Dinner at Home, Gluten-Free and Low-Sodium. Closed Tags: dal, indian, lentil. 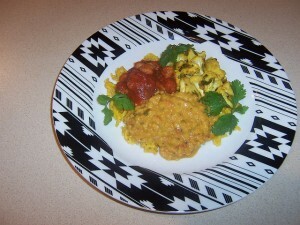 This is a creamy variation of a more traditional red lentil dal that is great comfort food on a cold evening. Makes 4 to 6 servings. Pick through the lentils to make sure that there aren’t any lentil shaped stones that crept in during harvesting. Rinse the lentils in cold water and set aside in a strainer. Heat the oil over medium heat and add the onions. Sauté for 5 minutes or until the onions are translucent to golden and soft. Add garlic, ginger, coriander and cumin. Sauté for about a minute. Add the tomatoes and cook for about 5 minutes. Add the lentils and remaining ingredients, cover and cook, stirring occasionally, for 30 to 40 minutes or until the lentils are tender. Serve with naan instead of (or in addition to) the rice. You can use an immersion blender to make this even creamier. 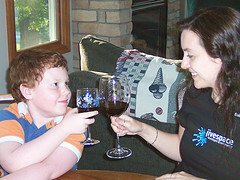 Published on May 11, 2011 in Gluten-Free, Low-Sodium and Potlucks and Parties. 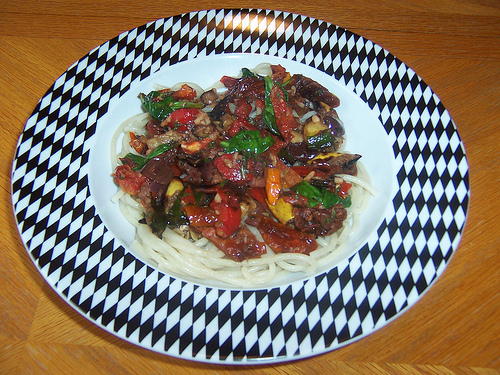 Closed Tags: italian, mediterranean, quinoa, salad. This is one of my favorite potluck foods to bring when I know I won’t have many vegan choices, since it seems more like a real meal than a salad. Makes 8-10 servings. Rinse the quinoa, then dry roast until you smell a nutty aroma while you boil the water in another pot. Add the boiling water to the quinoa, turn the flame down to a low simmer and place the lid on the pot. Cook for 20 minutes. Turn off the heat and let sit for an additional 5 minutes with the lid on. Transfer to a bowl and set aside to cool. Combine ingredients for the marinade, pour over cooled quinoa and stir to mix. Add sun dried tomatoes, olives and pine nuts. Stir again. Cover and refrigerate 2-6 hours or more. Before serving, cover the top with sliced cherry tomatoes. Add other chopped vegetables for variety. 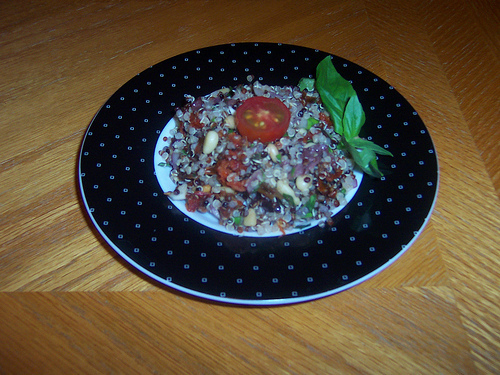 Use half white and half red quinoa for a more colorful salad. Omit the olives for a low-sodium version. 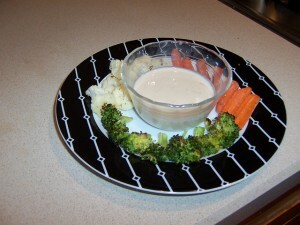 Published on May 9, 2011 in Dinner at Home, Gluten-Free and Low-Sodium. Closed Tags: pasta, vegetables. This is a great summer meal when the fresh veggies are plentiful and the tomatoes are ripe and delicious. The only caveat is that this really isn’t a traditional “sauce”, but more of a vegetable topping for pasta, so you might want to encourage people add a little olive oil to taste at the table. Makes 2 to 4 servings. Heat olive oil in a saucepan over medium heat. Add garlic, mushrooms and wine. Sauté for 2 to 3 minutes until mushrooms start to soften. Add zucchini and summer squash. Sauté for 3 to 5 minutes until vegetables have softened. Add tomato, spinach, basil, salt and pepper. Add water, vegetable broth or a little more oil if it seems too dry. Cook for at least 3 to 4 minutes, but you can cook a little longer if needed. Add sun dried tomatoes, kalamata olives, pine nuts and / or artichoke hearts. Experiment with other vegetables, like broccoli, cauliflower and bell pepper. Add 1 8 ounce can tomato paste for more tomato flavor. Can be easily made low-sodium. Make a gluten-free version by serving over another grain.